Marketing - BrewTech Robotics Inc.
Our marketing team at BrewTech Robotics designs our advertising media and our Marketing Presentation PowerPoint. This is a behind-the-scenes view of our morning TV show, TecTV. 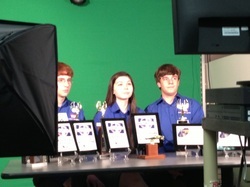 Taylor, Ben, and Victoria are filming a special segment for the support of BrewTech BEST Robotics that airs via YouTube, along with other school announcements and special segments. BrewTech Robotics Inc. employees and department heads making a business presentation to Brewbaker Technology Magnet High School's PTSA members. Thursday October 3rd, 2013.